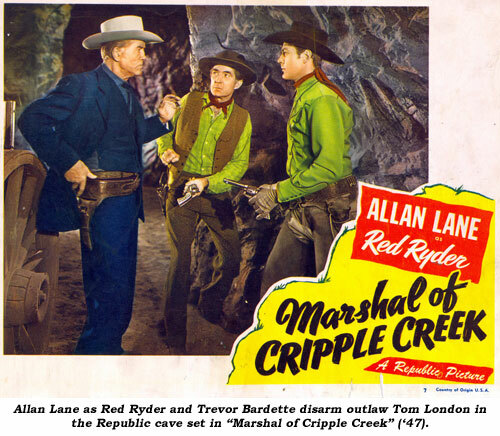 forgotten, that of the murderous Peg Leg in Bill Elliott’s classic Columbia serial, “Overland With Kit Carson” (‘39), so effective was his desire to be helpful (when not in his Peg Leg guise) it seemed nigh impossible he could be the mysterious renegade. Then in Republic’s “Jungle Girl” (‘41) serial, his assumption of his murdered twin brother’s identity brought no trace of suspicion from Nyoka. In Columbia’s “Secret Code” (‘42) as a spy leader he was a bit more forthright in his evil deeds. 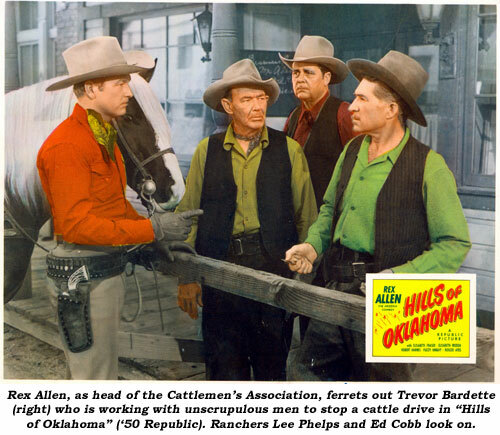 Throughout his career, he seemed to play important roles in B films (Roy Rogers, Rex Allen, Rocky Lane, etc.) 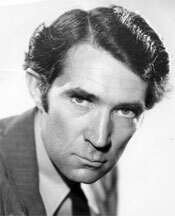 and smaller character roles in important films (“Oklahoma Kid” ‘39, “Gone With the Wind” ‘39, “Abe Lincoln In Illinois” ‘40, “Uncertain Glory” ‘44, “Dragonwyck” ‘46, “Big Sleep” ‘46, “Sea of Grass” ‘47, “T-Men” ‘47, “Union Station” ‘50, “Thunder Road” ‘58, etc.). 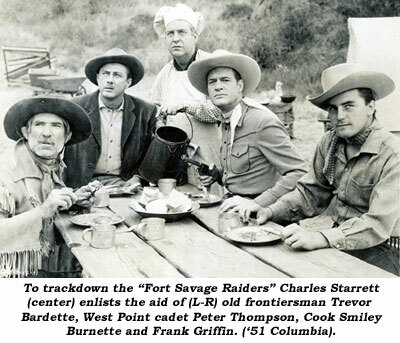 For TV he specialized in fathers and slightly off-kilter older miners, trappers, ranchers and the like. 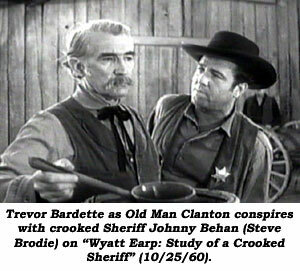 Perhaps Bardette is best remembered by TV audiences as Old Man Ike Clanton during the Tombstone episodes of Hugh O’Brian’s “Life and Legend of Wyatt Earp” (Sept. ‘59-May ‘61). One-fourth Cherokee, Bardette was born November 19, 1902, in Nashville, Arkansas, of Scotch, Irish, French and Cherokee heritage. After graduating from Oregon University, his adventurous spirit found him in Mexico on a gold mining venture. That might have been his life’s work if he hadn’t run into a bit of gun-play with some Mexican peons and decided to pursue a less hazardous existence. Bardette then attended Northwestern University, achieving a Master’s degree, intending to be a mechanical engineer but was sidetracked into drama through course work while in college. After working in various stock companies throughout the Northwest, he began his acting career in earnest in New York in the musical “Flossie”. Various other stage engagements kept him busy through 1936 when he went to Hollywood to pursue a screen career. In his first film, Bardette befriended Hopalong Cassidy as Mexican Secret Service Agent Col. Gonzales in “Borderland” (‘37 Paramount), a role he repeated a year later in Hoppy’s “In Old Mexico” (‘38 Paramount). From then until 1970, the broodingly handsome, usually mustachioed Bardette never stopped working in a wide variety of over 170 films and nearly 100 TV episodes. 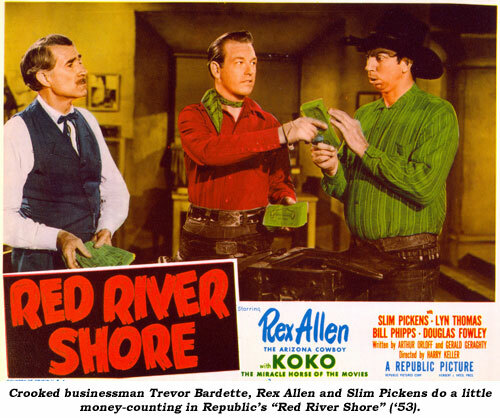 His last work was on a “Gunsmoke” episode in November ‘70. 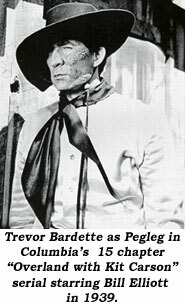 Bardette was residing in Green Valley, Pima County, Arizona, when he died, reportedly, in Los Angeles, California, November 28, 1977. Exact circumstances are unknown, but speculation is he was living in Arizona and being treated in California.